This article by José Valle first appeared in the September 2016 issue of the North Beach Sun. Quidley, one of OBAR’s eight 2016 scholarship recipients and a graduate of Cape Hatteras Secondary School, volunteered at the Fessenden Center in Buxton, N.C., making her a strong candidate for the award. “Financially, I wasn’t prepared for college, and I feel like the scholarship definitely helped with that,” Quidley says. “I just want to thank the people at OBAR for seeing potential in me and giving me the chance to make them proud.” Quidley plans to pursue a biology degree at the University of North Carolina at Chapel Hill. Members of OBAR decided to start a scholarship fund for local students in 1994 and then transferred the fund to the Outer Banks Community Foundation in 1996. Since its establishment, 111 students have received scholarship funds totaling $201,125. OBAR is now celebrating 20 years with the community foundation. Also in an attempt to help more students and ensure the longevity of the fund, the committee decided to award between eight to 10 $1,000 one-time scholarships per year. The number of scholarships awarded each year is decided before the committee begins reviewing applications. The foundation’s staff not only creates, but also puts out the application, screens the applicants, and passes on those that meet the criteria. In addition, the staff invests the fund as an endowment, ensuring its perpetuity; handles accounting and check writing; and manages student accounts with the universities, among other services that make things easier for the OBAR’s scholarship committee. The funds for these awards come from the work put in by OBAR’s annual surf fishing and golf tournament committees. This year marked the 27th anniversary of the golf tournament, with a record-breaking number of 29 teams participating. Karen Pierce, staff liaison to both tournament committees, says she thinks the success lies in the sense of community behind the fundraisers. OBAR members who serve on the scholarship committee truly get behind it too. Every April, they familiarize themselves with the criteria that the numerous applicants must meet — at least a 3.0 GPA, proof of financial need, and demonstration of community involvement — to determine who gets an award. By May 2016, they had dedicated countless hours narrowing the applicant pool from more than 60 students to the dozen or so they typically interview. Those being interviewed also gain from the interaction. 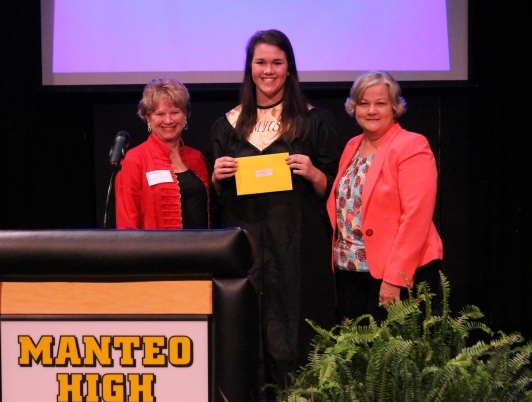 Kaitlynne Ludolph, a 2016 graduate of Manteo High School, was another scholarship recipient. She says she appreciated that the committee took the time to get to know her and helped with her dreams of pursuing a degree in media ministry at Southeastern University in Lakeland, Fla. According to Holly Austin, who served as the scholarship committee vice chair for 2016 and served as chair for several years prior, the success of the committee is due to the amount of dedication its members provide.